TH E M R EP O RT | 15 COVER STORY and use tools to view other home prices in their area. The servicer also introduced a new mobile application that allows millennials to learn about their financial situation while on the go. Kelly Ann Doherty, SVP of Corporate Communications for Nationstar, said she wants to encourage servicers to embrace millennials through education and assistance. "Nationstar's new website and mobile app speak to what needs to exist more broadly across the ser - vicing industry," Doherty said. "We need to focus on innovation and engagement. It's not just about how quickly you can get a customer into a mortgage, but how you can form a lasting partnership with a customer and make them comfort- able, educated, and empowered. This, in essence, is why we created these new tools. We want to put the service back in servicing. 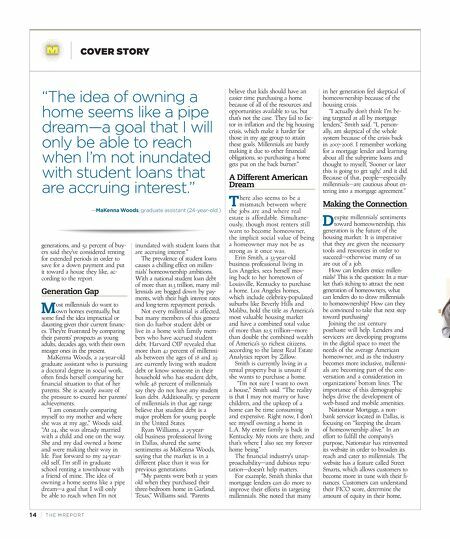 And for millennials, it's about giving them the tools they need to feel confident in taking that next step in their homeownership journey and helping them become smarter homeowners." Doherty, who is in the process of purchasing her first home, is all too familiar with the homeowner- ship dialogue. "As part of the millennial generation, I know for me it was important to wait to buy. I wanted job security, an income to afford the neighborhood that I wanted to live in, and I was married," she said. "You're seeing millennials change careers more often. They're getting married later in life. They're starting families later in life. As a result, taking that step toward homeownership is happening later in their personal journeys as well. At Nationstar, we know this process is a journey and tools like our new site and app help ensure we can be with our customers every step of the way." A Personal Touch M illennials are keen on educa- tion. Lenders should take the time to understand what millen- nials want and offer detailed solu- tions in order to help them attain their goals. Digital tools are impor- tant for day-to-day use. However, contrary to popular belief, most millennials prefer to consult with professionals in person, rather than using technology, when making huge purchasing decisions. Buying a car or a home is a big commit - ment, and face-to-face meetings engender trust on both sides. Dr. Svenja Gudell, Chief Economist at Zillow, said that as much as millennials enjoy technology, face-to-face interaction is best, especially when dealing with their financial future. "Don't assume millennials don't appreciate a personal touch," Dr. Gudell said. "They are just as likely as other generations to say they would like to meet their lender in person, and only one in 10 said they prefer communicating with lenders by text." Ed Robinson, President of the Cincinnati-based financial servicer Fifth Third Bancorp, said mil - lennials are in need of guidance when going through the home- buying process, just like any other cohort of homeowners. "When we work with millen- nials, we find they want much of what all homebuyers want: A guide through the house-buying process and a loan product tailored for them," Robinson said. 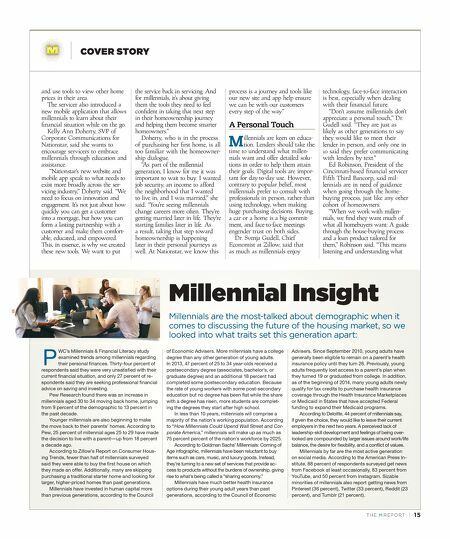 "This means listening and understanding what Millennial Insight Millennials are the most-talked about demographic when it comes to discussing the future of the housing market, so we looked into what traits set this generation apart: P WC's Millennials & Financial Literacy study examined trends among millennials regarding their personal finances. Thirty-four percent of respondents said they were very unsatisfied with their current financial situation, and only 27 percent of re- spondents said they are seeking professional financial advice on saving and investing. Pew Research found there was an increase in millennials aged 30 to 34 moving back home, jumping from 9 percent of the demographic to 13 percent in the past decade. Younger millennials are also beginning to make the move back to their parents' homes. According to Pew, 25 percent of millennial ages 25 to 29 have made the decision to live with a parent—up from 18 percent a decade ago. According to Zillow's Report on Consumer Hous- ing Trends, fewer than half of millennials surveyed said they were able to buy the first house on which they made an offer. Additionally, many are skipping purchasing a traditional starter home and looking for larger, higher-priced homes than past generations. Millennials have invested in human capital more than previous generations, according to the Council of Economic Advisers. More millennials have a college degree than any other generation of young adults. In 2013, 47 percent of 25 to 34 year-olds received a postsecondary degree (associates, bachelor's, or graduate degree) and an additional 18 percent had completed some postsecondary education. Because the rate of young workers with some post-secondary education but no degree has been flat while the share with a degree has risen, more students are complet- ing the degrees they start after high school. In less than 10 years, millennials will comprise a majority of the nation's working population. According to " How Millennials Could Upend Wall Street and Cor- porate America," millennials will make up as much as 75 percent percent of the nation's workforce by 2025. According to Goldman Sachs' Millennials: Coming of Age infographic, millennials have been reluctant to buy items such as cars, music, and luxury goods. Instead, they're turning to a new set of services that provide ac- cess to products without the burdens of ownership, giving rise to what's being called a "sharing economy." Millennials have much better health insurance options during their young adult years than past generations, according to the Council of Economic Advisers. Since September 2010, young adults have generally been eligible to remain on a parent's health insurance policy until they turn 26. Previously, young adults frequently lost access to a parent's plan when they turned 19 or graduated from college. In addition, as of the beginning of 2014, many young adults newly qualify for tax credits to purchase health insurance coverage through the Health Insurance Marketplaces or Medicaid in States that have accepted Federal funding to expand their Medicaid programs. According to Deloitte, 44 percent of millennials say, if given the choice, they would like to leave their current employers in the next two years. A perceived lack of leadership-skill development and feelings of being over- looked are compounded by larger issues around work/life balance, the desire for flexibility, and a conflict of values. Millennials by far are the most active generation on social media. According to the American Press In- stitute, 88 percent of respondents surveyed get news from Facebook at least occasionally, 83 percent from YouTube, and 50 percent from Instagram. Sizable minorities of millennials also report getting news from Pinterest (36 percent), Twitter (33 percent), Reddit (23 percent), and Tumblr (21 percent).